The Ministry of Civil Aviation in India seeks to develop an ecosystem for drone operations throughout the country. Civil Aviation Regulations (CAR) 1.0 provided guidelines for operating RPAS/UAS in India. After the launch of the digital sky platform under CAR 1.0, the ministry now wants to focus on addressing the challenges like Beyond Visual Line of Sight (BVLOS) and Autonomous Operations. On 15th January, 2019 at Global Aviation Summit 2019 held in Mumbai, HMoS Mr. Jayant Sinha had a panel discussion regarding Robust Drone Ecosystem and released a road-map. CAR2.0 will open up new business opportunities, create new jobs and position India as a global leader in this space. In this drone ecosystem policy road-map., the ministry has recommended key principles that should guide the drafting of CAR 2.0. CAR2.0 emphasizes on the need for a Drone Directorate within DGCA, who would then issue necessary guidelines, which maybe updated faster, as the needs of the drone industry differ from those of a Civil Aviation Industry. CAR1.0 allows the UAS operations to be carried out in both the segregated and the unsegregated airspace upto a maximum height of 120m and within visual line of sight. However for expansion and penetration of UAS-based commercial services, the UAS operations may be allowed beyond the current height limit of 120m in segregated airspace corridors. Drone corridor is a segregated airspace defined by appropriate authorities to keep commercial UAS operations out of the airspace in which manned aircraft operate. Relevant standards for certifications of airworthiness for UAS operations have been described in CAR1.0. However, BVLOS operations heightens the reliability concerns relating to operator’s control systems, control data link and onboard power while also increasing the potential for injury or damage to property. Therefore regulatory requirements must be independent of operational/risk environment assuming the highest risk. New principles of air worthiness were recommended to include safety by design, security by design and privacy by design. UAS TRAFFIC MANAGEMENT SYSTEMA UAS Traffic Management (UTM) should be devised to provide hyper-local and real-time information for managing UAS traffic, especially in the corridors. One of the key features described was Bi-modal control, which allows every UAS that is equipped with appropriate navigation and communication software and hardware to allow for live telemetry and other data exchange with UTM service provider. UAS must also allow for operational command to be transferred to the UTM service provider, at any time during flight, as and when directed by UTM. A detailed list of capabilities that the UTM system must be equipped with are mentioned in detail in the document. In short a UAS Traffic management system should be responsible for managing UAS induced traffic, especially in the drone corridor. DRONE PORTSDrone-ports are designated areas dedicated to facilitate take -off and landing of UAS. However, overtime their capabilities maybe enhanced to function as distribution centers, battery charging stations or any other appropriate use. The licenses to such ports maybe granted by concerned authorities upon meeting the prescribed technical requirements. CARGO AND DELIVERY CAPABILITIESThe commercial UAS operations will foster various new forms of air freight capabilities, such as creation of supply chain networks for delivery of payload, transport of temperature sensitive commodities like bodily organs, emergency or just-in-time deliveries of life-saving medicines, safe blood for transfusions and collection of patient specimens for delivery laboratory for time-sensitive testing. To mitigate the risk that these operations might carry, the government wants regulations that would allow business to carry these operations safely. MAKE IN INDIA INITIATIVE100% FDI in the UAS and RPAS-based commercial civil aviation services would provide a boost to the make in India initiative in this industry. INSURANCEUAS operators under CAR 2.0 are required to maintain comprehensive insurance to cover the liability towards cargo or any third part risks that maybe possessed due to commercial and/or BVLOS operations of UAS in compliance with Carriage by Air Act,1972 or any other applicable law. The government interprets the liability considerations to be increasingly significant considering the various risks that the applications possess. Therefore, insurance can cover legal fees and damages awarded against UAS operators. 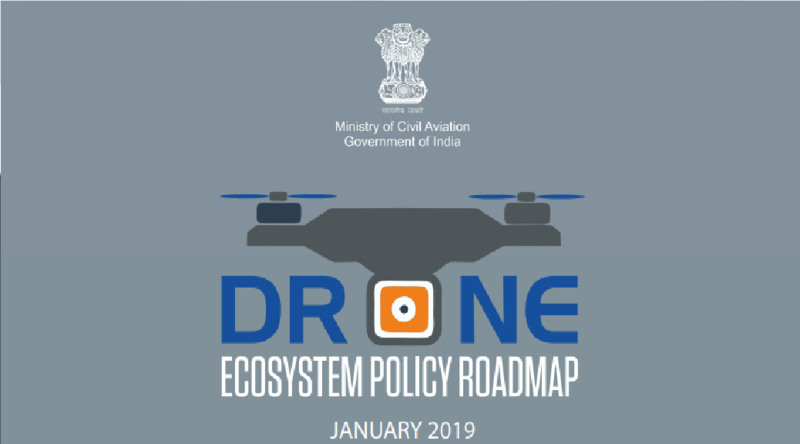 Detailed information related to the Drone Ecosystem Policy Road-map released on 15th January, 2019 can be found here.